NightLase® Treatment is a patented, fast, non-invasive and friendly way of increasing the quality of a patient's sleep. NightLase® lessens the effects of sleep apnea and decreases the amplitude of snoring through the use of gentle, superficial Er:YAG laser light. No anesthesia is used in this treatment. Research has shown that NightLase® reduces and attenuates snoring and provides an effective, non-invasive way to lessen the effects of sleep apnea. NightLase® requires no device to be worn during sleep, involves no chemical treatment, and no anesthesia. It is a gentle and easy way for the patient and their loved ones to regain a good night's rest. 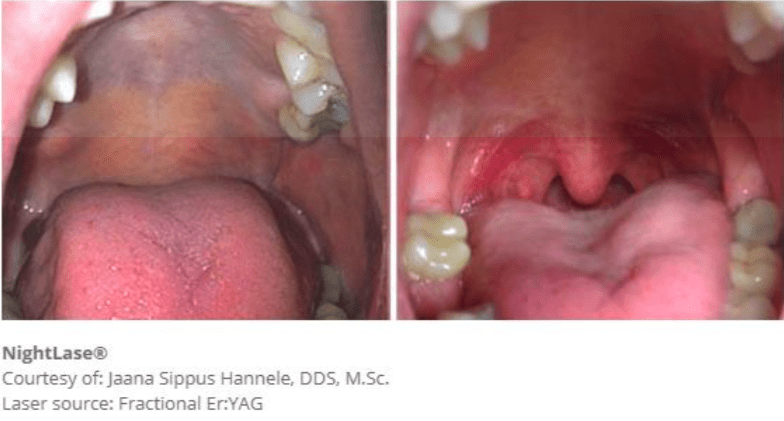 A full course of NightLase® treatment is comprised of three separate treatment sessions over a six week period.